It’s my contribution to the celebration in 2020 of the 500th anniversary of the sailing of the Mayflower. And, no, it’s not another account of the hazardous transatlantic journey and the adventures of the courageous Puritan founders of the Plymouth Settlement. That story has often been told and is embedded in American folklore. But the departure of a small group of religious radicals (one among many) for the New World is also part of the story of the Old World. Who were those extremist Protestants? Why could they not make a go of things either in England or Holland? What did they believe that set them so much apart from their neighbours? Were they really more heroic than those who chose to stay at home and continue the battle? Any answers must have roots both long and deep in the religious, social and political life of 16th-17th century Europe. The soil that nourished those roots and, eventually, proved too astringent for their continued growth, was compiled of various elements – religious intolerance, clashing political idealisms, vicious warfare by land and sea, exciting and disturbing discoveries about a shrinking world. In attempting to separate themselves from all this, the Pilgrims draw our attention to the complex realities of life in England and its neighbours. In proposing the ‘who’ and ‘why’ questions that have not been so brazenly asked before I have encountered many stories of fearless conviction, stubborn folly, heartrending suffering and downright chicanery. The resulting narrative is both moving and challenging – moving because we cannot fail to be impressed by the men and women who put religious conviction before worldly comfort and success; challenging because we are forced to abandon easy hero-worship and unquestioning admiration. 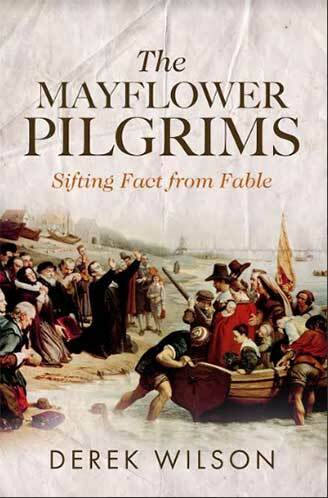 The Mayflower Pilgrims were, in the final analysis, people like us – warts an’ all.